Three weeks after arriving in Medellin, I finally made it to uber club Discoteca Mango’s. I went along with Max, an American I met at the hostel, this past Friday. The taxi ride from El Poblado was about 10,000 pesos ($4), and it turned out 10:30pm was a dreadfully early hour to arrive. The cover charge was a reasonable 15,000 pesos ($6), though we soon found the drinks expensive. Bottles of beer were 10,000 pesos apiece. All of the staff were decked out in wild west costumes, and one of several midgets was among the women greeting people at the front entrance. The woman selling tickets said it would get more crowded around 11:30pm, and later we found out Saturday nights are more popular and busy than Friday nights. We pulled up a few stools at the central bar, which was clearly set up for dancers to be jumping around on later in the night. From there, we had the rear view of the main stage. Flat screen TV’s flashed advertisements for the upcoming Mardi Gras theme night on February 27, while later in the night, typical images from New Orleans of women flashing for beads were shown. Max and I had a few beers, and then the show began with two pairs of dancers dropping from the ceiling above the stage on a fireman’s/stripper’s pole. They really know how to make an entrance at Mango’s! The two couples then proceeded to dance salsa on the main stage and at other smaller stages around the cavernous club. As time passed, the club started to fill out, though it was at maybe 50% of capacity at its peak. While there were more Colombians than tourists, there was the clear presence of white Western men and their Colombian wives, girlfriends, or escorts. Soon, the salsa dancers were replaced by troupes of go-go dancers, both male and female, dressed in various matching outfits such as faux policia. They all rotated around the various stages, dancing and entertaining. Even the midgets got into the act! The men’s bathroom was a sight to be seen, complete with water faucets the shape and size of a horses’ heads. Overall, the interior decor was far more comprehensive than I expected. A woman with a big digital camera asked for a photo with Max, myself, and Yasmine, a Colombian girl we had met. The best photos of the night are then uploaded to a gallery on the club’s website. Later, Max and I did a little dancing of our own, and eventually left around 4am, a half hour before closing. Overall, I would recommend Mango’s for a Saturday night visit, or on one of their theme nights, which will feature a higher cover, but a lot more people. mango’s disco in Medellin was the first disco versatile because they started to do shows with dancer and midgets. the midgets are extraordinary because they get attention of the people all night and more when they do their shows because they use costumes of kind different. besides mango’s disco is famous because the men’s bathroom was a sight to be seen, complete with faucets the shape and size of horses heads. in my opinion mango’s disco is the best disco in medellin because they have different shows each weekend and theirs decoration and attention of the place is amazing. The Mango’s covered in this blog post unfortunately closed its doors in March 2012. This was a not-to-missed wild-west themed discoteca that I went to several times over the years – my first time was back in 2007 and my last time to visit Mango’s was late in 2011. My understanding is that the owner closed Mango’s to reinvent itself as the club starting having trouble competing with the many other clubs in Medellin that were cheaper and Mango’s had a big contingent of hot dancers and other staff that had to be paid. The new Mango’s that has since reopened in the same location in Itagui is nothing like the former club that had claimed to be one of the largest in Latin America. It is now a much smaller bar with no stages. 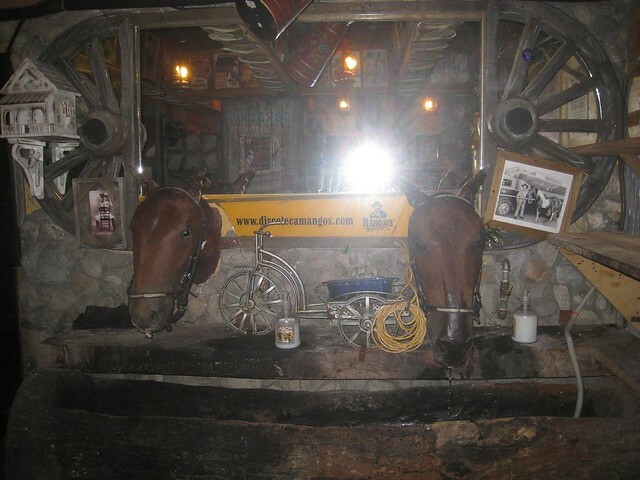 It sill has the western theme and the few waitresses in the bar all wear western outfits. But it is now more of a bar/cafe and no longer has stages with dancers performing like the old Mango’s. In fact, the sign in front of the place now says “Tropical Cafe – Mango’s”. I was there last weekend and Mango’s now has no cover and is more just a bar with a western theme. There was only a handful of Colombian couples there drinking late night last Friday – nothing really special. Much better is the discoteca that is now next door to Mango’s in Itagui – which is the second location of Dulce Jesus Mio. 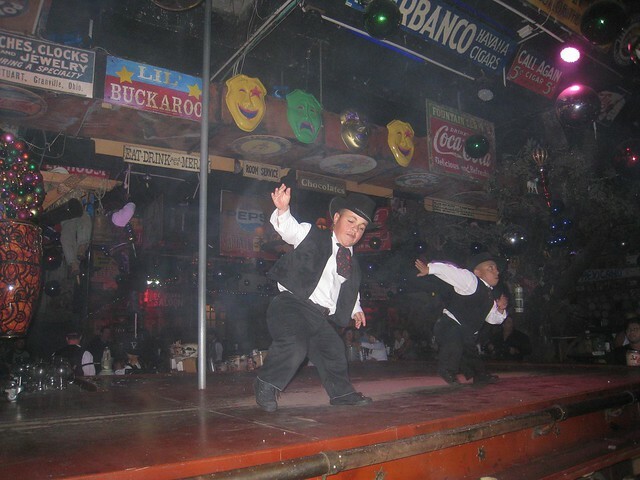 The Itaqui location of Dulce Jesus Mio is similar to the Dulce Jesus Mio found in Las Palmas with entertainers including midgets plus a stage show. Yes, I’ve seen the new Mango’s facade in passing, but haven’t bothered to re-visit it. Doesn’t sound like I’m missing much, compared to what it use to be.